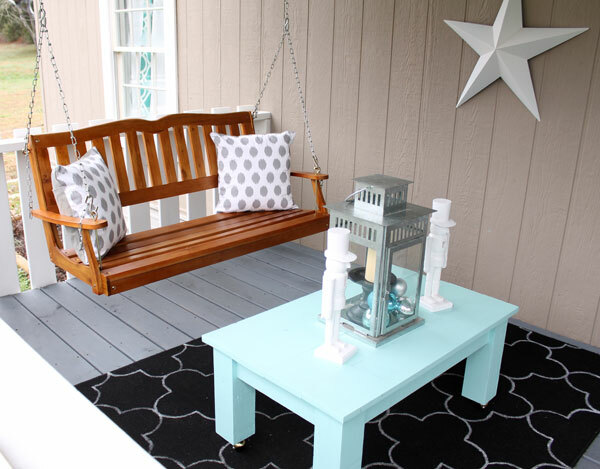 Porch decorating ideas is a whole new world for me. We just completed our front porch and side deck a few months ago, and I’m slowly putting together our outdoor spaces so we can enjoy them. Although this year it’s been a bit colder than in years past, we still hang out here as much as we can. Sprucing up the space for Christmas was kinda fun! 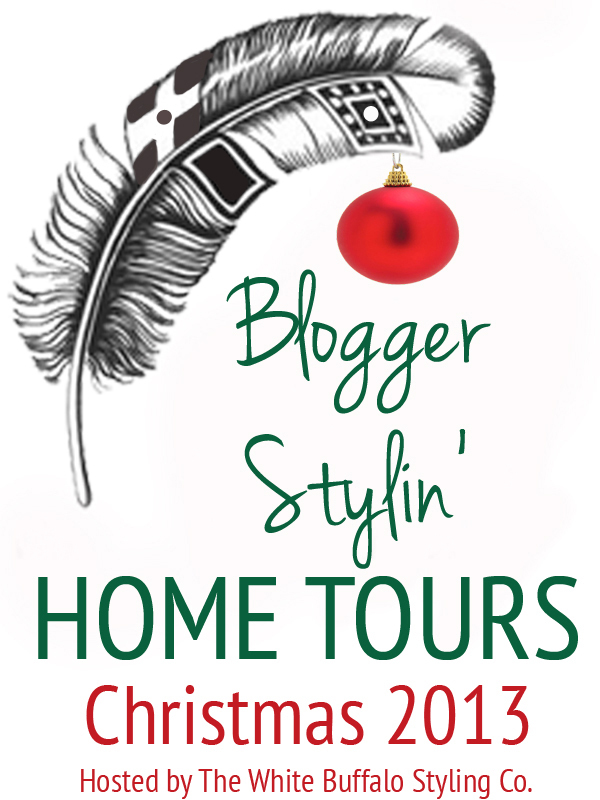 As part of the Blogger Stylin’ Home Tours with The White Buffalo Styling Co. this year, I’m really excited to share just how far we’ve come. If you’re just stopping by from This and That Life, welcome! 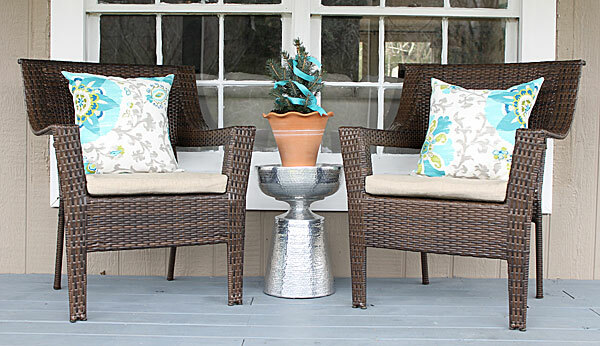 Right as you walk up onto the porch, these two chairs greet you. Hi there! 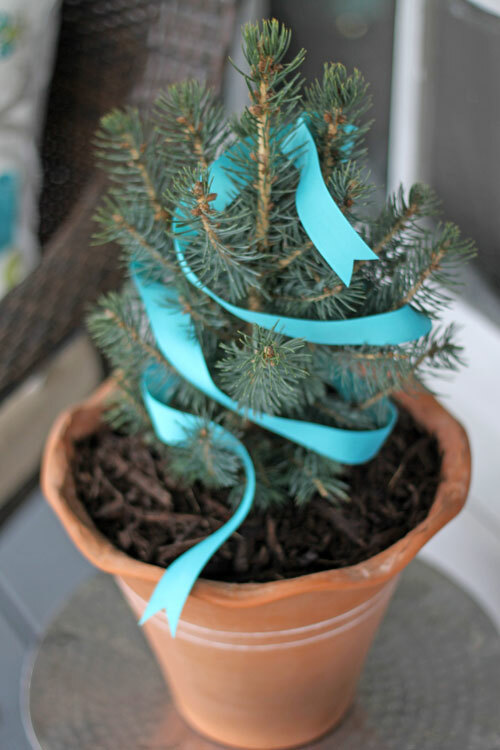 A baby blue spruce in a clay pot is a small nod to the holiday. In the spring we’ll plant it out in the yard and hopefully will be able to decorate it as a live tree in a few years. Our paint colors are from Sherwin Williams: Emerald Outdoor in Ultra White for the rails and trim (as well as the rafters on the roof) and Software for the floors. I’m in love with the white/gray combo – although it does look a little odd with our current tan siding. As soon as the weather is a bit warmer we’re installing new light gray siding, and I can’t wait! The chairs will get a makeover once that happens, but for the mean time I’m leaving them as is so it relates to the tan house paint. The porch swing area is somewhat small at only 8×8, yet our girls love swinging away. The painted rug I made a couple of months ago is still surviving nicely, too! The coffee table is also painted in Sherwin Williams Emerald paint in Aqueduct. I’ll be sharing a step by step tutorial on how to build it in under an hour next week so stay tuned! 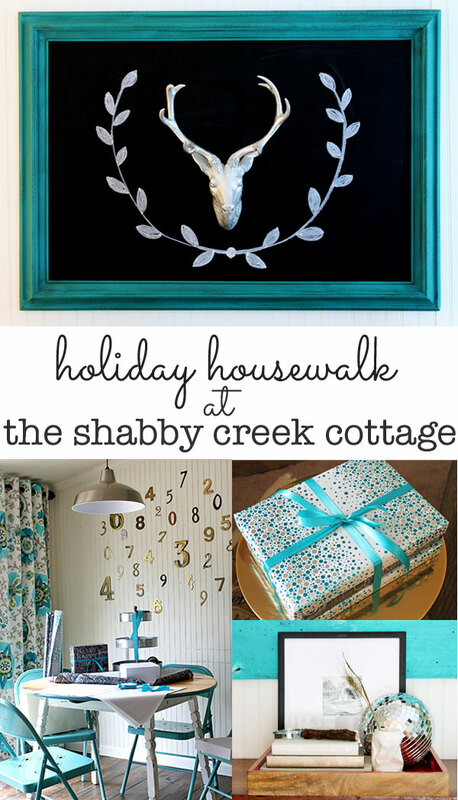 I hope you enjoyed my porch decorating ideas for Christmas! Make sure to stop over at Cassie’s house at Primitive and Proper to see her gorgeous space! And, if you missed my interior house tour, I’d love for you to stop by and see it on my Christmas Home Tour. WOW Gina…the porch looks over the top amazing! I Love it and that swing (my heart skips a beat!!! 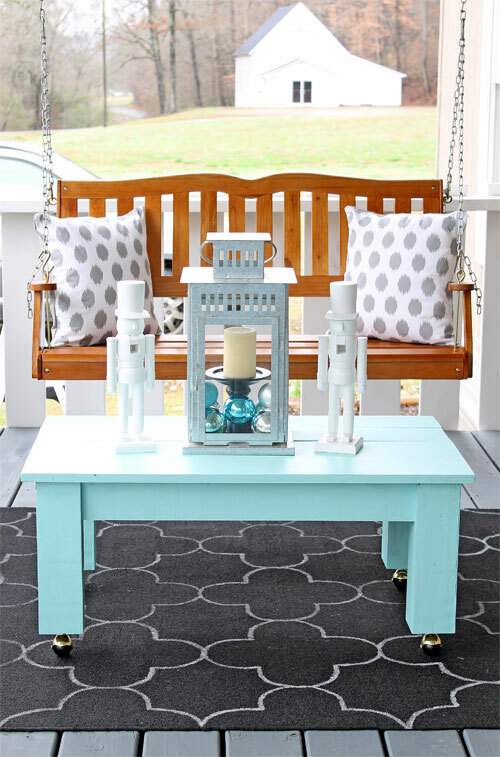 : ) A picture perfect porch all year round…but loving the sweet…subtle aqua holiday touches! You rocked this one…ooops…I have to give credit to the dynamic Shabby Creek Couple in this case!!!! The porch is really awesome and I hope to share my first glass of Southern Sweet Tea there some day in the future! : ) HUGS!!! Love the white and turquoise together for Christmas. So pretty! 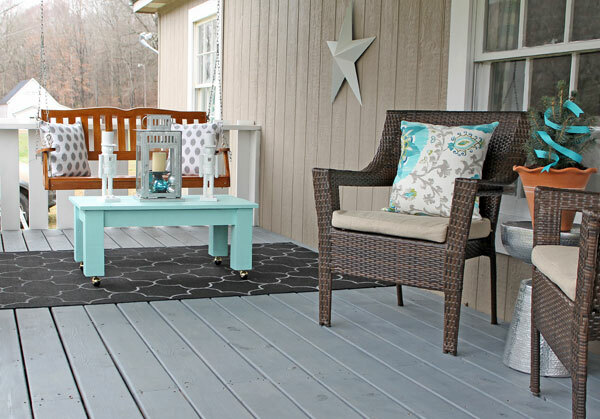 looks awesome- i love the touches of aqua ribbon and still love that painted rug! (oh, and my name is cassie. 😉 ). thank you for sharing your gorgeous home! 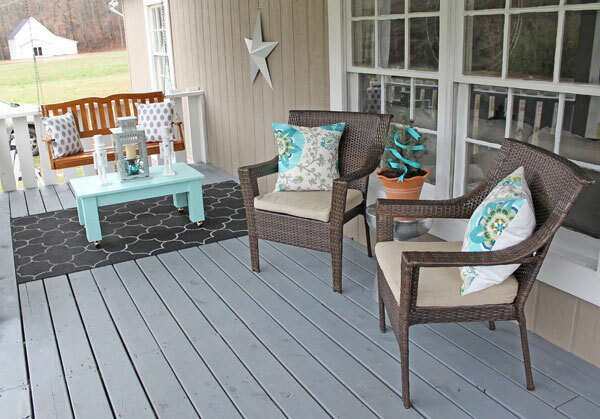 How exciting to have a porch to decorate for the seasons, and yours is amazing. 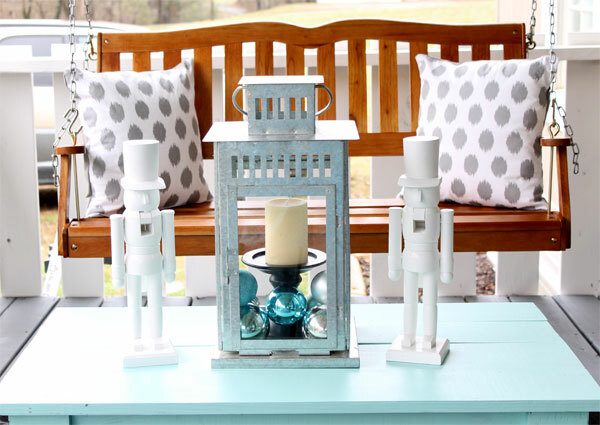 Love your coffee table and lantern with the white nutcrackers. Your porch is so pretty! I love the colors you used and your painted rug! Great job Gina! Not only am I loving your front porch (and SO happy for you that it’s DONE) but love all that space you have out there on that land! Have an amazing week! Love your porch!! So pretty and fresh!! I love how you brought blue into your decor. The non-traditional Christmas scheme totally works! Love everything! I love the pretty teal color! I’m also loving your front porch, I’ve always wanted a nice big porch like that! Love your awesome color palette. What a cozy porch! !